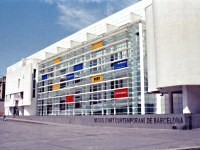 The Barcelona Museum of Contemporary Art is situated in the once-shabby Raval District, just off La Rambla. Over the years its front plaza has become synonymous with international skateboarders, being fondly known as the famous MACBA, drawing skaters and creatives from around the world to unite, compete and collaborate against the backdrop of this chic white building. Being a work of art in itself, the Museum of Contemporary Art was designed to take advantage of as much natural light as possible and the cool, airy interiors confidently hold the works of modern art luminaries such as Basquiat, Klee, Tàpies and Barcelò. Kids will enjoy the museum as there is a lot to touch and interact with - this is not your usual uptight gallery space. The museum has also made great use of technology, with an exhibition that allows visitors to download mobile apps which give additional information on each installation, even linking to YouTube clips about the artist of work of art. There is free wifi in MACBA and a comfy chill-out zone in which to take advantage of it. A perfect union of two art forms, MACBA and the attendant throng of talented skateboarders are a sight to be experienced. Opening times: 25 September to 24 June: 11am to 7.30pm Monday, Wednesday, Thursday, Friday; 10am to 9pm Saturday; 10am to 3pm Sunday; closed Tuesdays. 25 June to 24 September: 11am to 8pm Monday, Wednesday, Thursday, Friday; 10am to 8pm Saturday; 10am to 3pm Sunday; closed Tuesdays. Admission: €9 (general); €7 (reduced). Children under 14 free.